Sure, you can stuff your precious iPad mini into your backpack or handbag when you’re on the go, but of course, that means it’s going to be sharing space with many other trinkets and whatnot. Knowing that, it always leads to the possibility of something scratching or coming into contact with the tablet, which can result in some unwanted nasty baddies. Well folks, if you’re adamant about keeping your iPad mini fresh looking, like the first day you got it, then you might want to store it safely in its own bag. 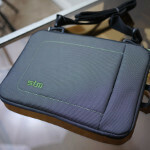 Enter the STM Jacket D7 sleeve for the iPad mini, a portable and personal carrying bag for your prized possession. If there’s one thing we like about this one, it’s that there’s nothing else that your iPad mini is going to compete with – since the zippered compartment only accommodates it. Considering that the interior compartment is lined with extra-soft polyester microfiber, it’s certain to keep the tablet secured and clean looking at the same time. Now, if you have any other smaller items to bring along, there’s also a second front-mounted pocket for them. Indeed, you can carry the STM Jacket D7 sleeve by grasping the handle, but for an easier hands-free experience, we recommend using the included adjustable shoulder strap. Made to withstand most weather conditions, we like how the exterior is comprised of water-resistant nylon to keep the iPad mini dry on those days when it downpours. Overall, the compact carrying bag is a simple and protective solution that’s sure to keep the iPad mini fresh throughout its lifetime. Available in either a black/green and chocolate/orange color combination, the best part about the STM Jacket D7 sleeve is its price. At a mere $25, it’s super affordable on any budget, but most importantly, it’s not going to break the bank. If you’re interested in picking this one up, click the link here to check it out.